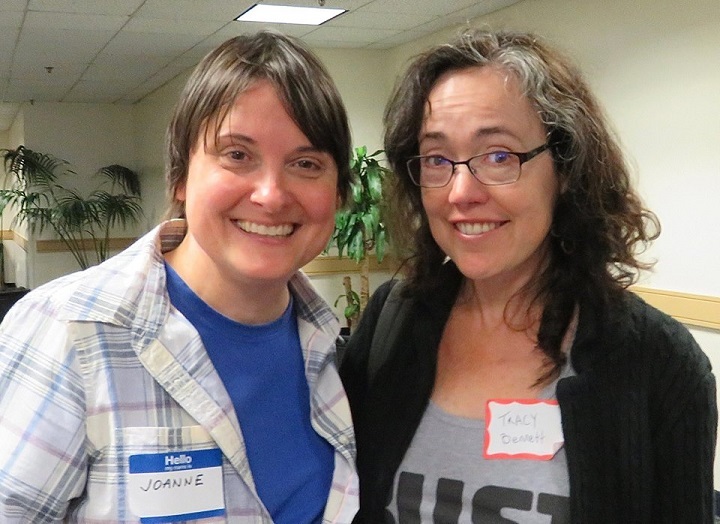 And I’m excited to welcome Joanne Sullivan as our latest 5 Questions interviewee! Joanne is a terrific constructor whose puzzles have appeared in The New York Times, The Chronicle of Higher Education, and numerous other outlets. One of her puzzles is now featured on The New York Times‘ Wordplay Blog as one of their 11 Remarkable Crosswords for New Solvers (each hand-picked by Will Shortz). Her puzzle with Erik Agard at the 2016 Indie 500 Crossword Tournament, “Do I Hear a Waltz?”, was one of my favorite crosswords last year. She often spends her time teaching crossword classes, spreading not only the love of crossword construction and wordplay to others, but hard-won knowledge and experience from a fun and innovative constructor. Joanne was gracious enough to take some time out to talk to us, so without further ado, let’s get to the interview! I’ve enjoyed a variety of puzzles and games ever since I can remember, but I had avoided crossword puzzles for decades. 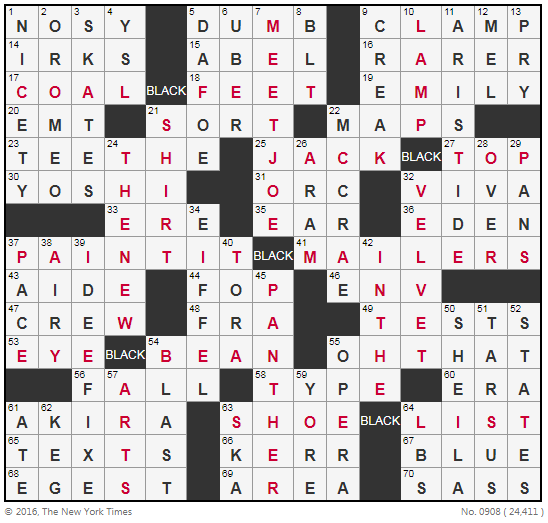 When I was a young adult, I would occasionally take a stab at The Sunday New York Times crossword and would manage to get only a couple of answers after reading every single clue. I was amazed that my father could routinely complete the whole puzzle. I didn’t aspire to match his achievement because I thought that crosswords were filled with useless, arcane information. When I subscribed to GAMES Magazine, I solved all the puzzles in it except for the crosswords because I had the mistaken assumption that all crosswords were dry and boring. I now realize that I missed out on a lot of fun. The high-quality crosswords in GAMES were part of the new wave of puzzles that were filled with current references and lively phrases. Many years later an office mate encouraged a group of our fellow coworkers to solve The New York Times crossword together each weekday. I never really enjoyed the computer programming work that I was supposed to be focusing on so I welcomed the diversion. I immediately was surprised at how clever and entertaining the crosswords were. Like the character in Green Eggs and Ham, I learned that I actually liked the nourishment that I had assumed would be distasteful. In the beginning, my coworkers would pass around the newspaper, and we’d each fill in an answer or two until we managed to complete the whole puzzle. We relied heavily on Google by the time we got to Friday. Solving late week puzzles without help seemed like an impossible dream, but before long that dream became a reality. [One of Joanne’s New York Times-published puzzles. This one makes excellent use of the black squares by incorporating some of them into the themed entries. 2. What, in your estimation, makes for a great puzzle? I personally love puzzles with inventive, tricky themes and clues. Crosswords have been around for a long time so it’s hard to come up with a new theme or a tricky clue that misdirects the solver in a different way. Even new themes and clues tend to be variations on something that has been done before so I appreciate crosswords that are truly original. What do you most enjoy — or most commonly avoid — when constructing your own? Coming up with a theme and finding answers that fit it. Filling the grid with non-theme answers. Adding new words to my database of potential crossword answers and rating those words in order of desirability. Maintaining a good database of potential crossword answers can greatly facilitate crossword construction, but I find database maintenance time-consuming and dreary so I avoid it. I try to rationalize my negligence by telling myself that it’s impossible to add words and assign values to them that will be valid for all audiences. For example, the word UGLY would be a perfectly fine answer in any mainstream newspaper, but I would try to avoid including it in a personalized puzzle that I was making as a birthday gift because I wouldn’t want the recipient to interpret it as an insult. But deep down I know that my rationalization isn’t valid, and I’m just too lazy to properly maintain my database. What do you think is the most common pitfall of constructors just starting out? I think some new constructors might settle for mediocrity instead of pushing themselves to achieve more. I’ve heard that some constructors are afraid to arrange the black and white squares in a grid from scratch. They’ll only use sample grids that they copy from a crossword database. It might take a lot of trial and error, but you’ll probably come up with a better grid if you try to arrange the squares in a way that best suits your theme answers instead of grabbing a prefab grid. I’ll often experiment with dozens of different grid designs before choosing one that fits my theme answers best. Constructors might also be satisfied with so-so fill (which are the non-theme answers) or clues. I can understand the urge to leave well enough alone, especially when submitting puzzles on spec. It can be really frustrating to spend a lot of time coming up with stellar fill and clues only to be told that your puzzle was dead on arrival because the editor didn’t like the theme. Instead of compromising their standards, constructors might try to seek out the few editors who are willing to preapprove themes. Or they may emulate the many excellent indie constructors who publish their puzzles on their own websites. It’s hard to pick favorites because I’ve solved so many great puzzles and clues over the years so I’ll be self-centered and mention three of my own puzzles. My Tuesday, February 23, 2010 New York Times crossword will always be close to my heart because it was my first published puzzle. Will Shortz picked it as one of the “11 Remarkable Crosswords for New Solvers,” but novices shouldn’t feel bad if they find it difficult. Most solvers found it harder than an average Tuesday puzzle. Another special crossword is “Contents Redacted,” which The Chronicle of Higher Education published on October 16, 2015. I’m very grateful to Brad Wilber and Frank Longo for polishing it and working hard to present it in a way that stayed true to my vision. I also appreciate pannonica whose review on the Crossword Fiend blog was clearer and more insightful than any description that I could have written. One of my most satisfying experiences was co-writing “Do I Hear a Waltz?” with Erik Agard for the 2016 Indie 500 Crossword Tournament. Working with Erik was a joy. He’s brilliant and extremely kind. You should interview him next! One great thing about making a puzzle for a tournament was having the flexibility to make an odd-sized grid that best suited our theme. I find that tournament puzzles are often very creative, perhaps because the constructors don’t have the same editorial and size constraints that they do at most other venues. Some of my favorite puzzles came from The Indie 500 and Lollapuzzoola crossword tournaments. As a solver, my favorite clues are the ones that make me think, “What on earth can this mean?” One recent clue that gave me that reaction came from Brendan Emmett Quigley’s 9/20/17 AV Club crossword (which is titled “The Lay of the Land”). At first, I couldn’t make sense of the clue [Like slightly firm elbows, e.g.] When I read it, I thought, “What the heck is a slightly firm elbow? … Hmm … AKIMBO doesn’t fit … Hmm …” Eventually I achieved a great aha moment — AL DENTE! I also love clues that put a fresh spin on old crosswordese or teach me interesting pieces of trivia. I find that The Chronicle of Higher Education and Peter Gordon’s Fireball Crosswords are particularly strong in that regard. 4. What’s next for Joanne Sullivan? I’m currently focusing on giving crossword puzzle seminars. For years I had mistakenly assumed that crosswords were boring and impossible to solve. Now I enjoy showing skeptics how fun crosswords can be and giving people tips that help them improve their solving skills. I love hearing from novices who tell me that I inspired them to start solving crosswords and veteran solvers who say that my tips helped them tackle more difficult puzzles. 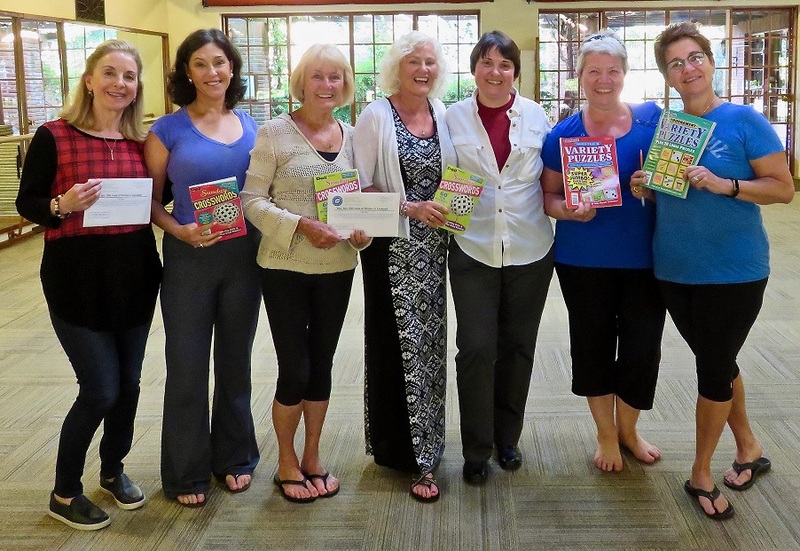 I recently taught my first children’s classes and was blown away by the kids’ intelligence and enthusiasm. I’m so glad those children caught the puzzle bug early and didn’t waste decades avoiding crosswords as I did. Read Patrick Berry’s PDF publication Crossword Constructor’s Handbook. The former print version of that book (Crossword Puzzle Challenges for Dummies) taught me more about constructing crosswords than any other source. Cruciverbalists might find the information about crossword construction interesting even if they don’t aspire to create puzzles themselves. The book includes 70 crosswords by Patrick Berry (who many crossword aficionados consider the preeminent crossword constructor) so it’s worth the $10 for the puzzles alone. A huge thank you to Joanne for her time. Be sure to keep your eyes peeled for her puzzles and her crossword seminars!